Relentless, marauding Ryan Kelly, having added another belt to Eastside gym’s crammed trophy room, is to prowl new pastures at welterweight. 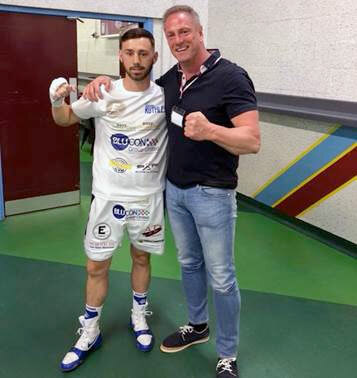 Kelly provided a near punch-perfect performance to dissect and dismantle Owen Jobburn for the vacant Midlands light-middleweight (11st) title. The Chelmsley Wood 24-year-old used ramrod jabs and rib-bending body shots to grind the fight from Jobburn in seven rounds. As impressive as the performance was, Kelly’s future is at 10½ stone, trainer, and fine former pro, Spencer McCracken, insisted. He will be an even more formidable fighting machine at the lighter weight, Spencer pledged. The news is a surprise. Kelly’s a compact, muscular light-middle who, at weigh-ins, looks as if he’s made sacrifices to hit 11st. But the move makes business sense. Domestically, the division teems with top talent, while the welterweight scene is less competitive. Light-middle is also the hunting ground of Adam Harper – the only man to beat Ryan in a 12-fight career. He outpointed the wildly popular prospect for the area title 12 months ago. Both Kelly and McCracken insist the outcome would be very different if the pair met again. And on Saturday night, Ryan looked twice the fighter who was dragged into the trenches by Harper. He has learned from defeat.